Back in November, when they were in third place, not many people imagined that Kometa Brno would end up in a position where they would have to win their final 2 games of the season and get some help in order to make the playoffs. Yet, as they took the ice in Kladno on Friday night, the Kometa players knew they weren't in a position to control their own destiny. They needed to win and they needed help. In the game they could control, they did their job, getting 2 goals from Jozef Balej in a 5-1 road win. After that, they could only hope that either Energie Karlovy Vary or Benzina Litvínov, or both, lost in regulation. Karlovy vary game. Photo: hokejcb.cz. Karlovy Vary went into their game in České Budějovice needing only a point to get in. After Mountfield's Pavel Kašpařík and Energie's Petr Sailer traded goals in the first period, goaltenders Jakub Kovář and Lukáš Mensator closed the doors the rest of the way. When regulation time expired with the score tied, Karlovy Vary was in. With the outcome no longer important, Karlovy Vary even replaced Mensator with Lukáš Sáblík for overtime, and he stopped the only shot he faced in the five-minute extra period, but Mountfield ultimately won in a shootout. Like Karlovy Vary, Benzina Litvínov also needed only a single point to qualify for the post-season. They trailed the visiting Liberec team 4-3 in the third period, but Richard Jareš tied the game with just under 16 minutes to play. Then, with only 1:29 remaining in regulation time, Jareš struck again with the game-winner, putting an exclamation point on the game and assuring his team a playoff spot. The race for first place was also settled on Friday night, as Oceláři Třinec shut out Plzeň 1929 4-0. Combined with Liberec's loss in Karlovy Vary, they clinched top spot in the Extraliga standings, which will earn them a spot in next year's Champions Hockey League if it actually occurs. Třinec got 2 goals from Radek Bonk and 26 saves from Peter Hamrlík, who earned his league-leading sixth shutout of the season. In an interesting note, defenceman John Slaney of St. John's, NL played on a forward line Friday with Nick Johnson of Windsor, CT and John Lammers of Langley, BC, creating for Plzeň what might have been the first all-North American forward line in Czech Extraliga history. BK Mladá Boleslav kept alive their hope of avoiding a play-out series by beating visiting Slavia Praha 1-0. Former Vancouver Giants goaltender Marek Schwarz made 26 saves for the shutout. Boleslav still sits in last place, but trails Kladno by only 2 points. 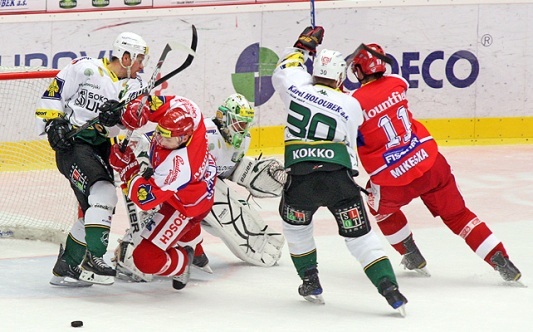 In their last game, Boleslav visits Eaton Pardubice, while Kladno hosts Litvínov. With Karlovy Vary and Litvínov clinching, all 10 playoff teams have now been decided. As well, the top six teams, who automatically advance to the quarterfinals, have been determined as well. Games on Sunday will determine seeds 3 through 6, and 8 through 10.